Serialization is the process of converting an object to byte stream in order to save them to memory or database or to file system. Here is the complete explanation of what Serialization is and how it works, from msdn site. Then click on 'Serialize' or 'serialize tree' option present under the developer tab at the top. Note: The 'Serialize' option will serializes only the selected item but the 'Serialize tree' option will serialize the selected item and its sub items. Go to the Sitecore instance's folder and check the path ' \Data\serialization\master\sitecore\' . Here you could see the serialized files of the 'Content' item. i.e., 'Content.Item' file and 'Content' folder. YOu can confirm the same by checking the last updated date of these two. Deserialization is the reverse process of serialization. i.e., converting the byte stream to an object. Copy the 'Content' folder, 'Content.Item' file and paste in destination folder. The destination folder is nothing but the target machine to which you would like to move the changes. Main the same folder structure in destination Sitecore instance. i.e., Copy those two under 'DestinationSitecoreFolder\Data\serialization\master\sitecore\' folder. 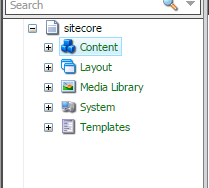 Now to go the Sitecore content editor, select 'Content' item and click on 'Revert tree' option under Developer tab. A dialogue box will open showing the progress of the revert option. Sitecore will read the serialized files on the desk (the files what we copied just now) and revert the select item and its sub elements as per the files. Thus the changes are moved from source to destination Sitecore instance. When you open this page, you can see options to select the database and then to choose whether to serialize or revert databases. So select serialize in the source machine and then copy the entire folder and in the destination path. 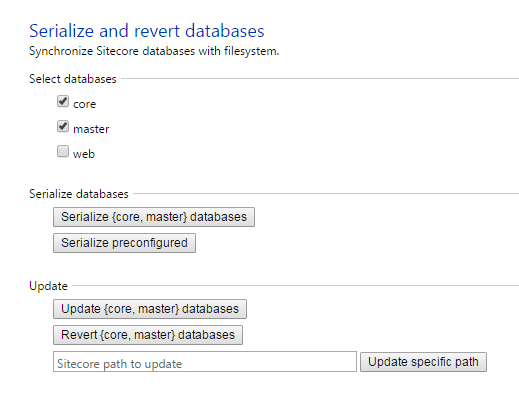 Then select database in the destination sitecore instance and click on revert option to deserialize.